Changes are afoot for the solar industry in the UK, with the Government confirming that more cuts are to be befall the feed-in tariff, alongside a range of other ‘tweaks’ which are due to be implemented at the beginning of August. It would be fair to say that the solar industry in this country hasn’t had the best run of late. With subsidies slashed by more than half their original worth, it was confirmed last week that the Government is to impose yet another round of cuts. Currently 21p/kWh, from 1 August FiT levels for small-scale solar PV installations will be reduced again to 16p/kWh. “We can now look with confidence to a future for solar which will see it go from a small cottage industry, anticipated under the previous scheme, to playing a significant part in Britain’s clean energy economy. A generation tariff of 16p/kWh will apply, down from 21p/kWh. FiTs will be gradually reduced every three months – or even frozen – depending on the uptake during the preceding quarter. Rather than the current 25 years, new installs will be subject to a 20 year tariff lifetime. The export tariff will be increased from 3.2p/kWh to 4.5p/kWh. 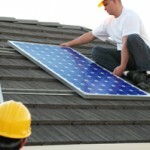 NEXT POST Is the future bright for solar power?